Your 1904 Morgan silver dollar value is being pushed higher by active collector demand and rising bullion prices. Currently any 1904 dollar is worth $19.78 . Collectors make their presence known by the premiums they pay for certain mint marked dollars and the condition of the coin. Typically collections are formed by date with examples representing each of the mints striking silver dollars of that year. It is the 1904 silver dollars produced by the San Francisco mint that are the ones to look for. Mintmarks identify these coins, see the image below the value chart to help find their location. Condition is also of great importance to the desirability of any coin. Collectors strive to add the finest quality examples they can afford to their collections. Pictured is a gem "uncirculated" 1904 Morgan dollar, representing a very desirable coin. Each coin is evaluated by dealers and collectors as to its condition and this coin is considered uncirculated because of no wear to its surfaces. 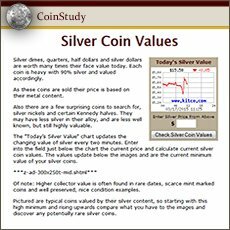 Compare your silver dollar to the grading images and descriptions found further down the page. 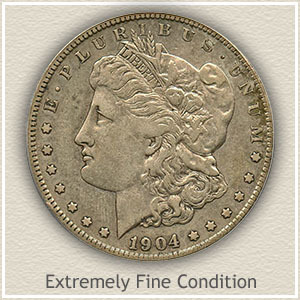 Along with mintmarks, your accurate judgment of condition helps find the correct 1904 Morgan silver dollar value from the chart. Now let's see if you have the valuable "S" mintmark, indicating your coin was struck at the San Francisco mint. 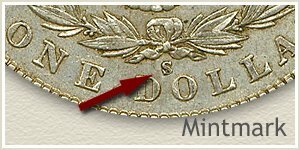 All mintmarks are on the reverse of Morgan silver dollars, near the bottom just above the DO in Dollar. Three mints produced dollars in 1904, "S" for San Francisco an "O" indicates the New Orleans mint. If no mintmark is present your coin was produced at the main mint in Philadelphia. Finding a 1904 dollar with the "S" mintmark is a good start, valued higher than many other dates. Recognize the coin is in better than average condition and now it is possibly worth over $100. If confirmed the condition is "uncirculated" meaning without wear to the surfaces, it is a rare coin. Top condition examples of the 1904-S Morgan dollar are elusive. In the marketplace nice eye appealing coins sell above $1000 routinely. Still radiating original bright mint luster the coin pictured is the quality many advance collectors pursue. Tinges of pale blue and gold add color to Liberty. A few marks and small abrasion are present, however not detracting. A pleasing silver dollar and a welcome addition to any premium grade silver dollar collection. Well received at a David Lawrence rare coin auction, it realized $3000 as a final bid. 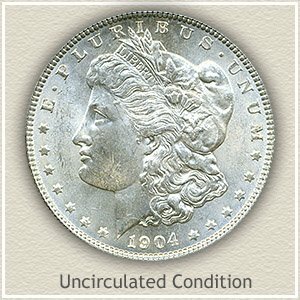 At multiple thousand dollars choice uncirculated 1904 Morgan silver dollar value demonstrates the commitment of serious collectors. 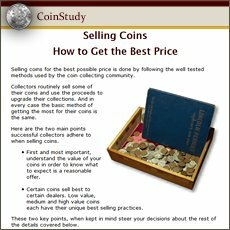 Necessary to finding highest accurate coin values is determining condition. By closely examining the surface and judging the amount of wear reflect its "grade." Entries in the value chart above are listed under these grade headings. 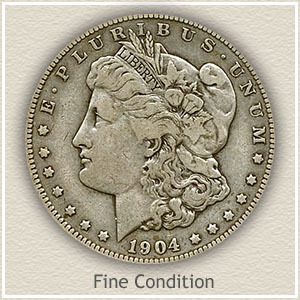 And in the case of your 1904 silver dollar, if struck at a branch mint, many subtle details have a significant role. Extremely Fine: Wear has started to diminish small details of the hair just behind Liberty's ear and forehead. Further behind the ear the folds of the cap are now just slightly flattened. On the revere, small amounts of wear are visible on the tops of the wings, and obvious on the neck and breast feathers. Light overall wear defines a 1904 Morgan silver dollar in extremely fine condition. 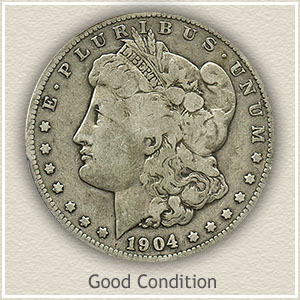 Good: A 1904 silver dollar in "good" condition is distinctly "flat" in appearance. The original separation of Liberty's hair and forehead has worn away. Her ear still shows, however hair above and behind is smooth and connecting to her cheek. Liberty is visible in the head band but the cotton blossoms are now lost. With the exception those minted in San Francisco 1904 Morgan silver dollar value in this grade is tied to its metal content. 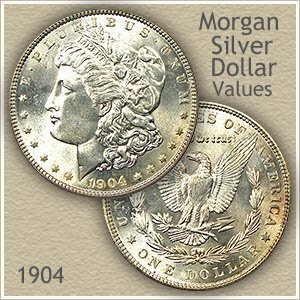 Including more relating to your 1904 Morgan silver dollar value. These early dollars are becoming valuable. Easily find how much your old coins are worth.